It is always gratifying to see Australians writing books, and the above authors between them are frequent gratifiers of all Australians, publishing as frequently as they do in the journals and books representative of their interests. Dr Anderson is particularly prolific, in the child neuropathology field, and Melbourne in particular has spawned the likes of Kevin Walsh and Jennie Ponsford, as well as the trio above, and the contributions from the Melbourne school in neuropsychology have been awesome. It's a tough series of acts to follow, but the authors above do not let us down. The tiny book is packed with crisp and clear analyses of the nature of the problem. References to such luminaries in the field as Russ Barkley abound, and overall there must be more than 350 references in the 23 pages at the end of the book, as well as a comprehensive index. Their approach homogenises a variety of thoughts we all have on this contentious issue, in many ways akin to the controversies in the autism spectrum, or perhaps any condition in childhood which presents somewhere between average behaviour and grossly unusual behaviour. As the coming epidemic of mental illness threatens progress in the modern world, all of us in the West have come to question if the demands of modern capitalist life are not incompatible with wellness. As an illness of our time, ADHD may indeed reflect child rearing practice in a society which has changed considerably under the influence of modern capitalist demographics, including dependence on day care which may not meet the understood needs of children at various stages in their lives, depending on various stages of brain development. The authors quote a leading Australian commentator who notes that the minute you see such variations like this in medicine and mental health, you are looking at opinion-based, not evidence-based medical practice. What the authors do in this book is try to move away from linear approaches such as the narrowly defined medical model, to a more cybernetic, second order system which would see the psycho or neuropathology as embedded within the interactions between child and social substrate, not within the skin of the child. Hence the blind application of a germ or disease-centred medical model, using curative medication or intervention, would fail, given the multifactorial picture they paint. Why has this child, produced these symptoms, at this stage of his/her life? I have argued for years that the central question in psychiatry is diagnosis in its original form: literally dia-gnosis , or 'through knowledge'. Dr Leslie Koopowitz, in Adelaide, a teacher in psychiatry, makes the same point in the three-question approach about the child, the symptom, and timing of the emergence of these symptoms in this child at this time of their development. In many ways, the three-question approach typifies the biological, psychological, sociological, approach. What is within the skin, what is within the mind, and what is within the world of this person that compels the production of these signs, NOW? However, the authors make it plain that we should not fall into the linear epistemological trap of assuming that the environment causes the child to become ill, or its genes cause it to become ill, or some milieu events cause it to become ill. This is again, linear, cause-effect relationship, anathematic to circular second order cybernetic feedback thinking. In the interaction of the genes, the family, the school, the world, the thoughts, the endocrines, the stem cells, the cytokines, the chandelier cells, the loud words, absence, separation, working parents, lousy child care, rapid-fire stimulation, grief, emigration, loud TV, and any one of the hundreds of causal chains and context markers, a pattern connects which represents how this child, at this time of its life, demonstrates the symptoms of ADHD, and communicates this in producing symptoms. The medical or other linear models thus produce and represent punctuation points, or rather focal points in a complex system, descriptions, not explanations, which result from a cross-sectional slice approach to diagnosis, rather than a developmental framework. The authors here are advocating a much more comprehensive series of interventions. The epistemology above certainly represents the thinking of Family Therapy, of a more global determinism than the biology, or social or psychological domains of development would represent. We must remember that in neuropsychology, a concatenation of symptoms does not represent a syndrome, nor does linear definition of test outcomes provide meaningful data. The unfortunate consequences of this combination of ignorance with delusion are numerous, including the inappropriate application of tests to probe for evidence of cerebral abnormality, the uncritical interpretation of test findings and, most important from the standpoint of the patient or client, the drawing of unwarranted conclusions about the state of his whole brain or some geographically labelled part of it (page 8: Evolution of a clinical specialty. The Clinical Neuropsychologist 1, 5-8). The complex presentation of ADHD lends itself particularly well to an exploration that can move beyond the linear thinking of symptom and syndrome, allowing us to look for patterns of interrelationship within a broader context. It is for this reason that we introduce an attempted integration of neuropsychological and psychodynamic approaches to understanding ADHD, a condition that appears to operate on the boundary between brain function (the realm of neuropsychology and neurology) and the child's emotional and social relationships within the family and the outside world (p 11). The implications of such thinking of course go wider than the application here to ADHD, but of course have an impact on thinking in the wider, broader spectrum of all childhood conditions seen in context. The dynamic relationship between families and the lesser and greater facets of the units of social structure can, must, and do colour the presentation of any organic substrate, as Neurologist, Bill Blessing of Adelaide has suggested, when he asserts that we cannot dissociate the feeling of thirst from the subsequent search for water. Not only that, the overall effect of strain-inducing stress on the brain is well documented in other conditions, altering the way DNA is expressed, suppressing hypothalamic-pituitary-adrenal axis functions, and rendering the organism even more exquisitely sensitive to stresses in turn, and hence making ongoing stresses even more excitotoxic (see the works of Marin Teicher, Danya Glaser, John Ratey, J Douglas Bremner, Michael De Bellis, Bruce Perry and others). This is not war on the medical model, but a call for intervention from multidisciplinary teams. If one cannot eliminate the complex chain of events ending with the phenotype of impairment represented by ADHD, then one must intervene within society, avoiding a disposal diagnosis, recognising that medication is not cure, avoiding coalitions against the child, containing their anxiety, accepting psychodynamic principals that all, including bad, behaviour is meaningful, the need for appropriate authority and the knowledge of the importance of containing and supporting boundaries, working as partners with parents and teachers, improving child care arrangements, bridging the gap between home and school, dealing with separation and divorce, making positive changes in the school environment, supporting boys in the face of the demands of modern and future societies, an most critical, working with prevention in the wider social and political context. This is a most important work, and with a wide audience, readable by everyone, even the damned parents. 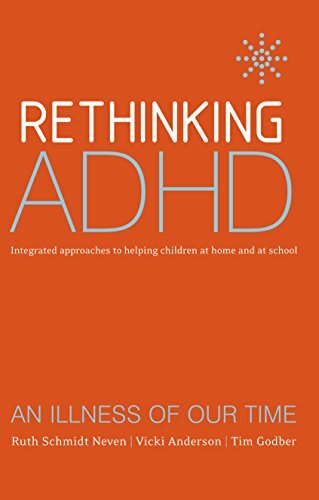 It really is crucial reading, given its evidence base, that psychiatrists, psychologists, teachers, general practitioners, magistrates, judges and politicians become aware of the problems facing those who rear and mind children in the 21st Century, not just for ADHD, but the whole wide and varied spectrum of mental disorders. This book is really well done. The last chapters need a great deal more detail and planning if the advocacy of such an approach is to go ahead. The post-modern view is really overdue, and the deconstruction of the terms we use is now a demand of the biopsychosocial model, and of the consumer.